The day you get out of the Army, for about five minutes, you feel great. You’ve been planning to get out for a while and now, after all the out-processing and mental list keeping of the days to expire, your serious case of short-timer’s disease is over. Lying on a bed in the purple twilight of that first evening of freedom, after four long years of soldierin’, I had a thought I hadn’t expected. I would have to take responsibility for myself from now on. That last bit is the thought you have after those first five minutes are up. Now, I would have to know where I was going. Sarge wasn’t in charge anymore. I headed back to Southern California, fell in with some shady film school types and careened into a bunch of bars as I went through the motions of becoming an actor. In short, I wasted time and wore out those who loved me. After two years, I fell off a roof and busted my wrist. I couldn’t get around so well and I needed to figure out what was next. All I knew was, partying wasn’t working. I felt like that guy who used to be in the Rolling Stones when they asked him why he quit. He told them he left the band because he wanted to go on living. That summer I sat by a community pool and challenged myself to read a book, and sometimes two, a day. I got really into pulp adventure novels and I also read a lot of mysteries by Raymond Chandler and some others. One day I picked up a copy of Ernest Hemingway’s The Old Man and the Sea (Yes, I was trying to get through some classics I’d missed as well). Suffice it to say, the book really resonated with me. Two years out of the Army, making a serious mess of my life with almost zero actual forward momentum, the tale of the unlucky and yet plucky Santiago the fisherman resonated deep within me. I felt ‘curst’ too. I felt like no one believed in me anymore. I felt like it was time to prove myself, even if that meant I needed to go out a little deeper into the Gulf in order to catch the big fish. In other words, it was time to lay it on the line and take some chances. Or, in other words: take life seriously like most people do. But let’s back up a bit. I’d always been a science fiction reader. And, I’d also fancied myself as a bit of a writer from the time I’d first read The Lord of the Rings. I was smart, in the Army they called me “Brain”, and I love to tell stories. I was always thinking about them on long road marches or in the long silences one finds out in the wilderness when we were in the field. I’d even taken to getting these stories down on paper and reading all the standard books about how to write best sellers and who was who in the world of publishing. I sent out a few short stories and got mostly rejections. But, there was one standout. An old SciFi magazine, I’m not even sure if it exists anymore, called Pandora’s Box sent me a really awesome rejection letter. Whoever that editor was found the good in my freshman scribblings and encouraged me. They also pointed out the rough spots and gave me a few pointers on how to fix them. That letter, now in hindsight, was better than actually getting published. It was kind and decent and it encouraged me to reach for the stars and write more. I took the editor’s suggestions and eventually did get a story published in a different magazine (A Chinese to English monthly that mainly seemed to be for students to practice their English). But since getting out of the Army and taking up drinking and carousing, I’d totally dropped any kind of actual effort at real writing i.e. putting words down on screen. My efforts under the influence were pitiful and unprofessional. Long story shortened for time’s sake, I became an actor and began to take life seriously. I also took up writing again and studied how to become better at it. Here’s a book every writer should read: Stephen King’s On Writing. I read the authors I wanted to write like and I wrote like them. I worked in a bookstore (Border’s). I submitted to magazines, publishers, online webzines and got rejected a lot. Even so, each time, and without fail, before the rejection could fully set in, I sat down and re-wrote whatever had just been rejected and put it out there again. In time I got an agent, Jeff Gerecke of the G Agency, who really loved a dark satire of Hollywood I’d written called Fight the Rooster which remains unpublished. The novel never sold, but about that time the whole Amazon/Digital Publishing thing was winding up, and I had another little novel I’d been working on which my agent didn’t want to represent (He said it was too much like Cormac McCarthy’s The Road, which I guess he didn’t like). I decided to try the Self-Publishing Digital experiment and I put my novel The Old Man and the Wasteland up. See, I’d been rereading Hemingway’s The Old Man and the Sea every year. It’s a really short book and it only takes a day to read. I also loved video games. The game Fallout in particular. One day I was lying on my bed and I thought, “Wouldn’t it be great if The Old Man and the Sea were set after a nuclear holocaust!” You know, that thought we’ve all had. Just kidding. But I did have that thought and in time, metamorphosing, that thought became the novel The Old Man and the Wasteland. The story of a nuclear war survivor who’s only had Ernest Hemingway’s classic tale of man versus nature to read in the forty years since the bombs wiped out the planet. Let’s just say the book, especially Santiago, has become very real to him. That book did really well! I sold 80,000 copies and my agent found a publisher, HarperVoyager, who was interested in doing two sequels and another undecided project. I finished the sequels and you can find them in The Wasteland Saga. Now, on August 12th, that unnamed project will be released. It’s called Soda Pop Soldier. It’s basically Call of Duty meets Ready Player One. I drew on a lot of my military knowledge to write this fun tale of video gaming in the future. So, I don’t soldier anymore. I used to long ago. Some nights I have dreams that I’m back in the Army. Those dreams are good dreams and the people I knew are still young. They haven’t changed. I miss the military in certain ways and if my country ever needed me I’d ruck up and fight. But I’m a writer now. 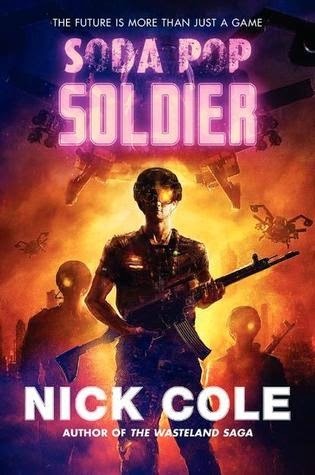 I still tell stories just like I did when I was in the Army, and some of those stories, like Soda Pop Soldier, are even about soldiers. It was a long journey from soldier to writer, but I think you’ll enjoy some of the things I experienced along the way. Call of Duty meets Diablo in this fast-paced, action-packed novel from the author of The Wasteland Saga. Gamer PerfectQuestion fights for ColaCorp in WarWorld, an online combat sport arena where mega-corporations field entire armies in the battle for real world global advertising-space dominance. Within the immense virtual battlefield, players and bots are high-tech grunts, using drop-ships and state-of-the-art weaponry to wipe each other out. But times are tough and the rent is due, and when players need extra dough, there’s always the Black, an illegal open source tournament where the sick and twisted desires of the future are given free rein in the Westhavens, a gothic dungeon fantasy world. And all too soon, the real and virtual worlds collide when PerfectQuestion refuses to become the tool of a mad man intent on hacking the global economy for himself. Nick Cole is an Army veteran and working actor living in Southern California. When he is not auditioning for commercials, going out for sitcoms or being shot, kicked, stabbed or beaten by film school students, the author of The Old Man and the Wasteland and The Wasteland Saga can often be found as a guard for King Phillip II of Spain or a similar role in the Opera Don Carlo at Los Angeles Opera.